Why does it feel like we’ve done so much, yet still accomplished nothing? Day trip to local site? Okay, not so much to still do, but the painting’s a big one, and one that really has to be done when The Husband’s around. We’re already halfway through break! Yikes! The MS1s transitioned to MS2As* finished a week ago and there was a flurry of “First year of med school done!” posts on Facebook. First, 4 months <> 1 year. Second, you haven’t even taken anatomy yet! *MS vs. M is to distinguish the new curriculum from the old. 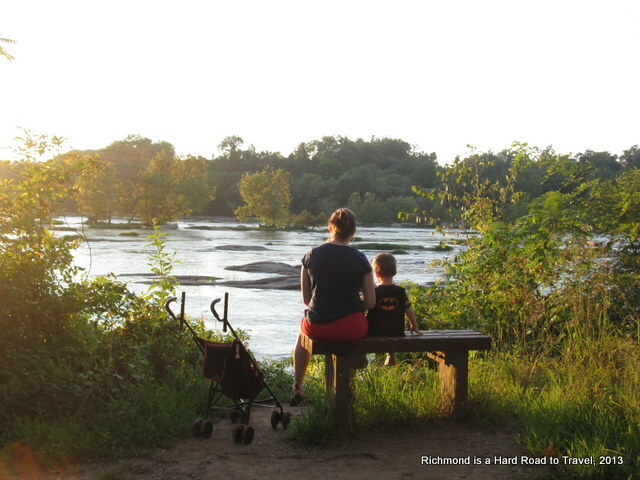 Yesterday marked one year in Richmond. I’ve liked it more than I thought I would. There’s a lot more stuff (parks, libraries, museums, funky shops, etc.) close by than there is in New Hampshire. We’ve met some nice people and reconnected with others from college. Still, I miss things like snow and mountains and not-I-want-to-die-heat-and-humidity (doing better than last summer though). I miss our friends. I still feel like a bit of an outsider. Mention on your Facebook that you think modern military bases shouldn’t be named after Confederate generals and you hear about it from a parent at the park. I don’t think I fit in with the other stay-at-home parents here. It seems there are two groups: the MOPS type (too Jesus-y*) and the organic, all-natural, attachment parenting type (too crunchy). Staying at home didn’t seem so political in New Hampshire. Maybe I just didn’t get out enough. I don’t know. I have found a BMF (Best Mom Friend, not to be confused with BAMF) who is neither so we go to the coffee shop together once a week after storytime at the library. 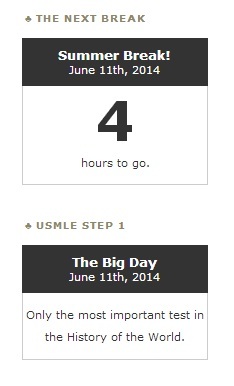 Medical school is both easier and harder than I thought it would be. I don’t get breaks until The Husband gets breaks, so I feel like a single parent at times. Weekends are not guaranteed. Often Saturdays become another weekday in terms of schedule. The Husband leaves for the library or school that morning (usually an hour or two later than real weekdays) and then I see him again around dinnertime. Sundays can be the same, although not as often. He’s pretty burned out by then. Most of our friends are fellow med students, so potential babysitters are busy at the same time I’d want them the most. Not many errands get done the week before a test. This summer–well, the two weeks after COT and before classes–I worked hard to get a little “me” time in. I hope it can continue a little bit into the school year now that we have a year’s perspective on scheduling demands, but we’ll see. The New Hampshire house is back on the market. I don’t have faith it will sell, so it will probably be rented out again. I hope people like moving in October. No? Bummer. Our savings account is about the same as last year, so that’s good. We did have a big tax refund thanks(?) to a drastically reduced salary for the second half of the 2012, but we also had a tree hit the house, so I’m not sure where exactly that puts us in terms of successful budgeting. In the past year, The Baby has become The Toddler. He has gradually dropped from two long naps a day to one not-so-long nap (hence the reduced frequency of blog posts). He’s very mellow and easy-going, but fiercely independent. He’s not into talking very much and would rather observe people and situations than participate. So, pretty much the same personality as last year, except for the independence. It’s hard to know if it was always there but we couldn’t tell because he wasn’t as mobile. His interests include tractors, planes, trucks, and cars. This has manifested into very distinct preferences for which shirts he wears. If he can see into the drawer, he wants the clothing with the motor vehicle on it. The Husband has been back at school for 2.5 weeks and has had his first test already, so we’re 26% done! *And seems to prey on vulnerabilities to covertly evangelize. Not cool, MOPS! Winter Break is over. Long weekend in 2.5 weeks! Two anatomy tests, then two celebratory parties and Winter Break can officially begin! The Husband has already been presented with a To-Do List.